The case of Ali Ismail Korkmaz, who died as a result of being beaten at a Gezi Park protest, is coming to head this week, with an expected conclusion this Friday, December 28th. Amnesty has been watching the trial closely since its very beginning. It is important not just for the tragic murder of a young man, not yet out of his teens, by police sworn to protect him, but also for disturbing signs that authorities attempted to stymie the trial from the start. On trial this week are not only those implicated in this brutal murder, but also a system of cozy denial and obstruction which has supported the culture of impunity in Turkey. As we await the court’s decision, Amnesty is calling on its supporters world-wide to help call attention to this important case through social media. 1. 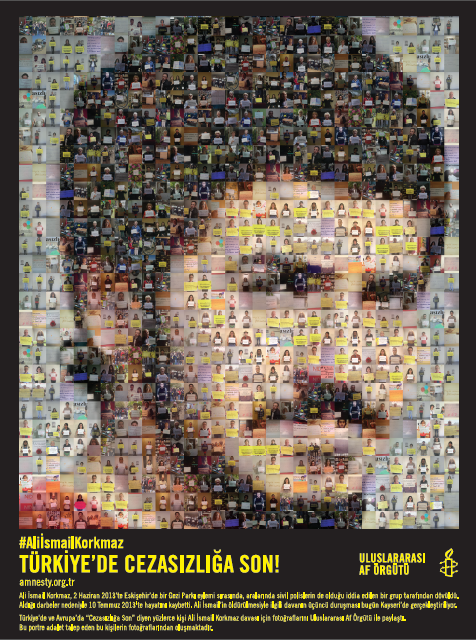 Use the image at the beginning of this blog, a photomontage created by Amnesty-Turkey for an earlier action regarding this case as your facebook or twitter image. As the case comes to its apparent close this December 28th, let’s ensure that the court – and Ali Ismail’s family and loved ones – know: the whole world is watching. This entry was posted in Amnesty International, Excessive Force, Freedom of Assembly, Freedom of Expression, Gezi Park, Impunity, Turkey, Uncategorized and tagged Ali Ismail Korkmaz, Amnesty, Amnesty International, excessive force, Gezi Park, impunity. Bookmark the permalink.